Marco Zanuso was born in Milan May 14, 1916. He studied architecture from 1935 until 1939 at Milan Polytechnic. In 1945, Zanuso opened an office in Milan and worked as an architect, urban planner and designer. He served as the editor of Domus in the late 40s and Casabella in the early 50s. Zanuso was a founding member of the Associazione per il Disegno Industriale (ADI) in 1956 and was its president from 1966 until 1969. He joined forces with Richard Sapper in the late 1950s, a promising young German designer living in Milan, with whom he collaborated until 1977. Together, they revolutionized chair design with the 4999/S (K 1340) chair for Kartell, a children's stacking chair with removable cylindrical legs and a ribbed back to make it lightweight. It was the first substantial and structural article made of injection molded, non-reinforced plastic. The design process began in 1960, production started in 1964 and ran through 1979. As shown below, the back of the chair is similar to the slats of the Ariante fan. The chair was constructed of polyethylene in the original design. After 1975 it was constructed of polypropylene. Kartell promotional image for the Zanuso and Sapper 4999/S (K 1340) chair. Image Source. For the exhibition “Italy: The New Domestic Landscape,” in 1972 Zanuso designed an ambulance that transformed into a living room. The Ariante fan is in the collection of the Museum of Modern Art in New York amongst other objects by Zanuso. Zanuso won Gold Medals at six and the Gran Premio at three Milan Triennali, as well as multiple Compasso d'Oro awards (listed below). The Compasso d’Oro logo, which relates to Adalbert Goeringer’s compass and to the golden section, was created by the graphic designer Albe Steiner. The three-dimensional Golden Compass is the work of Alberto Rosselli and Marco Zanuso. Marco Zanuso died July 11, 2001. 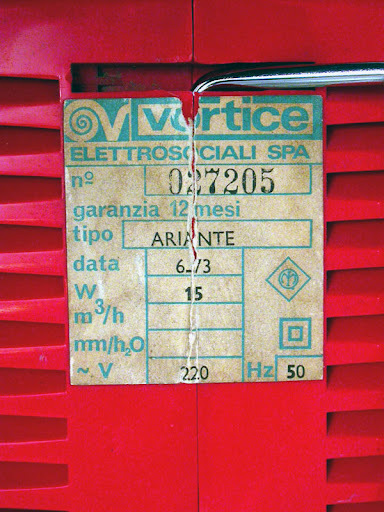 In the early 1970s, Zanuso designed a fan for Vortice Elettrosociali called the “Ariante.” It is 18.3 cm tall by 18.5 cm wide by 10.9 cm deep. The edition I have has a little label on the bottom indicating it is made of ABS (Cycolac ABS for shinyness, actually). Above: Cycolac ABS label on bottom of fan. The printed label on the bottom of my fan and another I found on online are shown below. Above: Black Ariante label (left) and red Ariante label (right). Image source. Below, different style labels on a red and white fan. Image source: eBay. The fan has a European plug and operates on 220 V / 50 Hz which means that it will work in the US with a plug adapter but it won’t exactly create a mighty wind. While the ventilator slats give the fan a great look, they are dustcatchers and you have to clean them out with a towel from time to time. The fan is not necessarily the cheapest of plastic items, it’s usually in the $100 range on eBay but it is also not particularly rare. There’s a red one here for € 320. I’ve seen the fan in white, red, and black. The red fan is featured in on p. 118 of L'Utopie Du Tout Plastique 1960 – 1973. The Ariante box. Image source: eBay. This red fan in very good condition and with the original box sold for £ 59 ($ 94) on 9/11/2009. Update 1/03/2010: The original link to this picture was broken so it has been fixed (with a different image from a different sale). Another eBay find, this one sold in Italy on 10/7/2009 and attracted 43 bids and a hammer price of 101 € ($ 145). Of interest, this item had a clip attached for wall mounting, shown below. Vortice logo on the top of the fan. Exploded view of the red Ariante fan. Image source. User marratime has a lot of other terrific pictures of modern items. An interesting and different fan bottom. Different labels. Production by Anson AG. Cycolac ABS label is much more prominent here than on the black fan! White Ariante fan. Image source: designonline. Black Ariante fan, in operation. Image source: eBay. This fan sold for € 79 ($ 115) on 7/17/2009. Left: Front of the black Ariante fan. Right: Back of the black Ariante fan, showing the switch and European plug. Philippe Decelle & Diane Hennebert & Pierre Loze, L'Utopie Du Tout Plastique 1960 - 1973, Edition Fondation pour l'architecture, 1994, p.118. I once sold one of these fans in baby blue, of all colors! It must have been an '80s edition.